So there’s much debate as to where the pavlova comes from – was it invented in New Zealand or Australia. Well being a Kiwi, of course I’m going to say New Zealand. Apparently it was named after the Russian ballerina Anna Pavlova. The meringue dessert was created in her honour after her tour Down Under. I’ve recently had a birthday and lucky girl that I am, I got given a Kitchen Aid mixer by my lovely family. I have coveted one for ages, so it’s great to have one in my very own kitchen, and try out lots of different recipes using it. 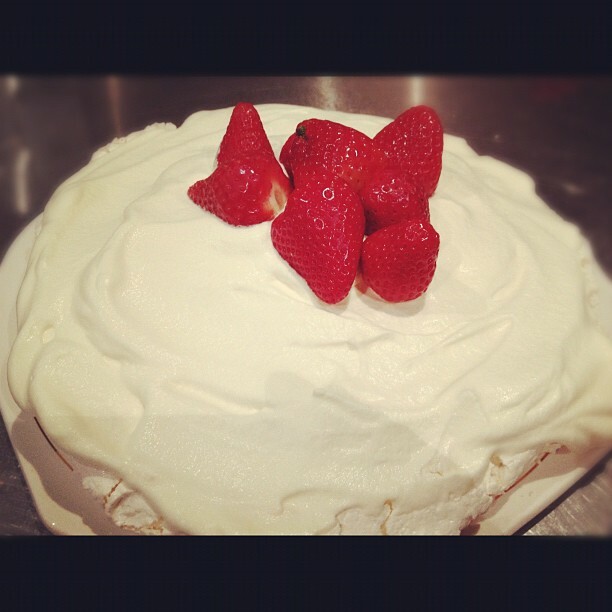 The first thing I wanted to try was a pavlova, a chance to truly get that whisk working! Plus as summer is now almost around the corner, the first New Zealand strawberries are appearing in the shops, and pavlova and strawberries is such a wonderful combination. I’ve adapted this recipe from the Kitchen Aid cookbook. 1. Preheat the oven to 170 degrees. 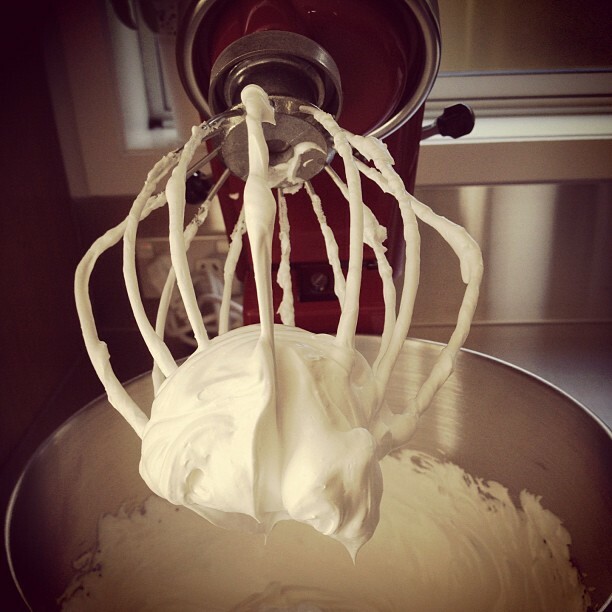 Whisk the egg whites and salt until frothy, then beat until stiff peaks form. 2. Add the sugar to the egg whites 1 tablespoon at a time. Wait until the the previous tablespoon of sugar has been incorporated before adding the next one. When the mixture starts to look glossy, continue to beat and add the sugar. When all the sugar has been added the meringue will be very stiff and glossy. 3. Sieve the cornflour over the meringue, then sprinkle over the vinegar. Fold both into the meringue with a large metal spoon. 4. Spread the mixture onto a circle on some baking paper. 5. Place the pavlova in the oven, then immediately reduce the heat to 130 degrees. Bake for 1 hour. 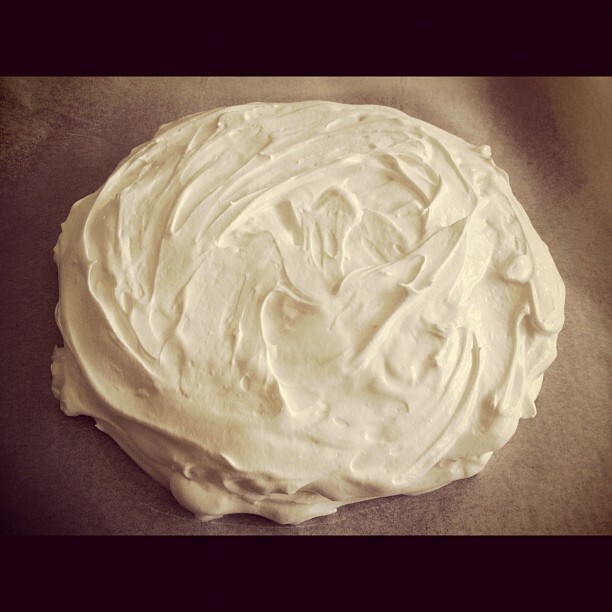 The pavlova is ready when it feels dry to the touch and can be easily lifted off the baking paper. Turn the oven off but leave the pavlova in the oven with the oven door ajar until it has cooled completely. This will prevent the pavlova from cracking. 6. Serve smothered with whipped cream and strawberries – or any combination of fruit.